South Beach will get the wigless version of Spinal Tap next month. We’re fairly certain you’ve been kept up late at night imagining what an acoustic version of Smell the Glove would sound like. Wonder no more! Christopher Guest, Michael McKean and Harry Shearer have come together again in Unwigged & Unplugged to perform songs from This is Spinal Tap and A Mighty Wind. 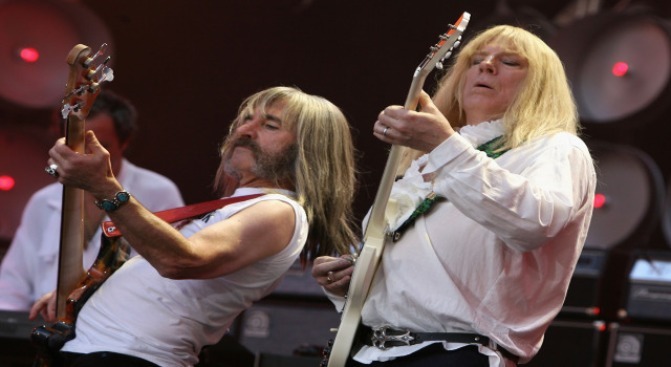 The trio will perform at the Fillmore on May 5 as part of a 30-plus U.S. city tour, without wigs and without electronic instruments, in celebration of This is Spinal Tap’s 25th anniversary. The performance won’t make your eardrums bleed, but it will bring you a little bit deeper into the intimate world that these old chums share. If you want more of their deadpan humor, there’s always the hilarious Best in Show and the somewhat amusing For Your Consideration. Maybe you’re really young and not familiar with the films or you’re too lazy to type them into Netflix. The good news is that you may already have played like Nigel Tufnel in “Tonight I’m Gonna Rock You Tonight” which is on Guitar Hero 2.